PEEK implants have been a major topic of discussion among medical researchers for more than a decade. Despite this, its full capabilities are still not completely understood, but what medical professionals do know is promising. In the past few years, a wave of medical studies and research projects have detailed the progress of PEEK implants in several fields of medicine. What’s clear is that PEEK is already a compelling choice in some procedures, particularly in spinal fusion and trauma fixation. Biocompatibility – Few materials are safe for use in the human body, and fewer still are safe and viable as an option for implants. This is why titanium and ceramics have long been leading options for many implant procedures. PEEK is also a fully biocompatible material. It doesn’t react to other tissues in the body, nor does the body react adversely to it. PEEK implants have been studied for more than a decade, and the safety of the material holds even after extended exposure. No cytotoxicity has been noted even in long-term studies. Similar properties to cortical bone – Some PEEK grades behave in a manner similar to cortical bone, and this is an important benefit that no other material can claim. Because PEEK functions much like bone once implanted, medical professionals can predict how the implant will function in terms of weight bearing and flexibility. As PEEK implants bear weight like natural bone, they don’t have a negative effect on neighboring bone density. Radiolucency – This is a primary attribute that drove material engineers into perfecting PEEK for medical applications. Metal implants pose a challenge with most imaging technology, as they generate artifacts on CT, MRI and X-ray imagery. Though the concerns here are obvious, they are particularly troublesome when the physician must assess the postoperative status of an implant. PEEK’s radiolucency is extremely valuable in this regard, as it will not interfere with a physician’s ability to accurately assess a procedure’s initial success and subsequent healing and recovery. Further, with total radiolucency on CT, MRI and X-ray scans, it’s far easier for physicians to spot and diagnose any postoperative complications. There are several more reasons why PEEK is gaining traction in medicine, like how PEEK offers excellent processability and how it can be machined into nearly any shape. That’s the top-down look at PEEK and a snapshot into why it is getting the attention it is. What are some examples of how PEEK is changing the way some surgeons approach their work? PEEK reinforced with Carbon Fiber will be a mainstay in trauma fixation – PEEK has already been shown to be a critical biomaterial for spinal implant procedures, and recent research suggests that the next field of medicine it revolutionizes is trauma fixation. There was reason to believe that PEEK would be a natural fit for trauma fixation, particularly as an option for fixation plates. Research confirms that PEEK is a compelling choice in this area, primarily due to its unbeatable combination of excellent fatigue strength and elastic modulus. Research into Carbon Fiber-reinforced PEEK plates compared their performance to metal, and the results were eye opening. 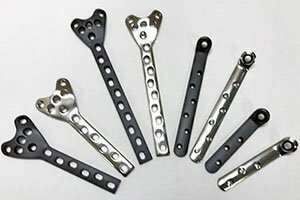 One study, published by David Hak, the interim director of the Department of Orthopedics at Denver Health (University of Colorado), found that PEEK fixation plates can handle loads comparable to stainless steel plates, and in some instances, exceed the load that stainless steel plates can bear. This study also looked at locking screws placed in PEEK fixation plates and assessed their mechanical stability. The study found that screws placed in PEEK fixation plates retain comparable or superior levels of stability, compared to stainless steel plates. PEEK implants are a promising option for cranioplasty – Cranioplasty remains a challenge even for veteran surgeons, as patient-specific implants are often needed to ensure no postoperative complications. As such, the first option for surgeons is to graft bone to the surgical site. However, when a bone graft is not available or suitable for the procedure, a PEEK implant is a viable alternative. A study published in the Journal of Craniofacial Surgery in 2014 detailed an initial review of PEEK in cranioplasty procedures. The study was small, as cranioplasty is a fairly uncommon procedure, and looked at 12 patients that received a PEEK implant during cranioplasty. The results were uniformly positive, as there was no sign of implant degradation, fluid leakage or infection. Even better, no patients had to undergo additional implant contouring, a process that requires an additional operation. PEEK’s excellent resilience and biocompatibility is clear. PEEK can serve as a foundation material for other biomaterials – Though PEEK has only been in widespread medical use for a couple of decades, there are engineering teams discovering new uses for orthopedic and spinal procedures. If there is one criticism associated with PEEK implants, it’s that PEEK doesn’t integrate with bone as well as some metal implants. This challenge is driving engineers to produce a version of PEEK that better integrates with native bone tissue. Solutions are on the near horizon, and they are pushing implant medicine forward. For example, there are already PEEK implant designs that include porous surfaces and PEEK implants with hydroxyapatite for enhanced bone integration. Together, these design features encourage bone to grow into the implant and lock in, producing a strong bond. PEEK implants are on the leading edge of what can be done in orthopedics, trauma fixation, cranioplasty and many other medical disciplines. As PEEK is further explored by medical researchers, its role in medicine will only grow. What Are The Uses Of PEEK Medical Implants?